Save money by cutting your own yoga mats! If you are looking for the most cost-effective way to furnish a yoga studio, you've come to the right place. Order our Classic 1/8" Yoga Mat Roll, cut the mats yourself with an easy-to-use rotary cutter, and you'll pay as little as $8 per mat! Each roll is 103" long which cuts into 17 extra long mats (72") or 18 traditional mats (68"). 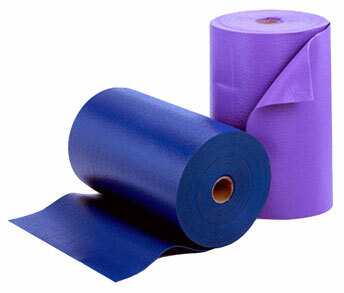 You are buying a roll of generic, non-skid, open cell, durable yoga mats at the standard 1/8" thickness. Perfect for furnishing studios, gyms, and schools! Just purchased theses for our students K-6. Perfectly fine for kids who now have their own mat. I purchased this large roll of yoga matting to create long runners throughout my house for my elderly cat who has traction problems with my hard wood floors. It's working perfectly. Sambuca approves. Purchased to cut runners on ceramic tile for our dog that has Degenerative Mylopathy. (ALS in humans). Works great. She has traction on the floors now and can move independently for now. Great in every way. The product, packing and delivery time were all terrific. Dark Brown great on wood floors! I originally bought the dark brown roll to create "walking passages" for our little semi-paralyzed terrier mix to navigate our home safely - not slip and further injure his spine on our slippery wood floors. Delighted with quality, color, ease of cutting with scissors - even more delighted with how GOOD they look - like runners! And our little Rocky has regained mobility due to new confidence in moving about safely. I'm not actually a Yoga exerciser. I use this product to line the bottom of my drawers. It's a great product, because it doesn't absorb anything, is easy to clean, and cushions the drawer bottom. Great stuff, in my opinion. We were looking for ways to help keep our dogs from slipping on hardwood floors and came across another website that recommended this site and using yoga mats as runners. the ordering process was easy, our product shipped very timely, and we are so very happy with the quality of this product! I will definitely be ordering more products from yogaaccessories.com! This is the third mat roll I've purchased from Yoga accessories and I wouldn't shop anywhere else. Great prices, great delivery speed, color is accurate and vibrant. The mats are easy to cut with a scissor - I recommend marking them with chalk and a level and cutting them with a regular household scissor. I picked this mat out for my school so we could teach yoga to the high schoolers. After receiving sample swatches and showing them the price, the school board approved it. The students are really enjoying yoga now.